For those without comedic tastes, the so-called experts at Wikipedia have an article about Banana Phone. 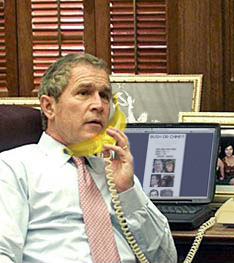 The banana phone is a telecommunications banana that transmits speech by means of electric signals, without the use of computers, TVs or quarters. 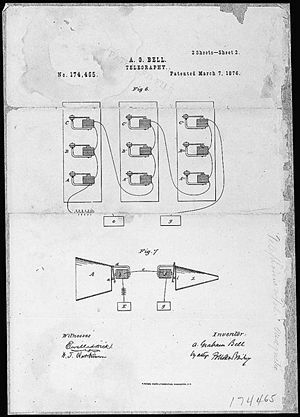 Alexander Graham Bell invented the device in 1876, when the advent of the stapler made such technology possible. Some historians have refuted that Dr. Sebastian actually invented Alexander Graham Bell. 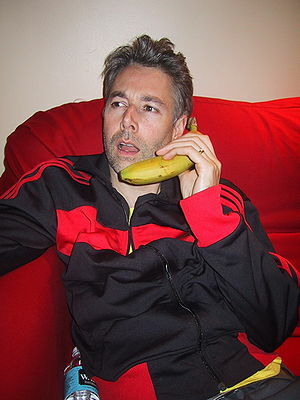 A popular myth is that the banana phone was invented by notable renaissance man Raffi. This is not true. If you work with electronics, you probably have some idea what the hell this means. Fortunately, modern banana phones are not made with such primitive technology. These days, banana phones work by using a long string to connect a banana to a satellite. The sound is compressed, so words rebel and hiss during transmission, but it allows anyone to talk to anyone else who has a banana phone whenever they want. Unfortunately the satellite will break orbit fairly often due to people pulling on the string too hard. Thousands occasionally die as a result. "I can't hear you. I have a banana in my ear." Talking on a banana phone while driving is often claimed to be the main cause of road rage. This is of course nonsense, because everyone loves bananas. A gripe with banana phones that isn't total bull, however, is the disposal of broken banana phones by tossing them out the window, onto the road. This often leads to a driver running over the banana and spinning out. This has caused no injuries or fatalities yet, but it has caused at least three hundred people to lose a race that they were going to win. This is a bananamarketer. 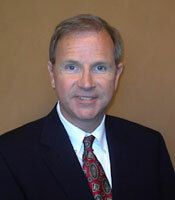 Notice that, like all banana-marketers, he looks like a jackass. 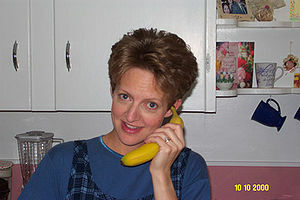 A common complaint by owners of banana phones is that they often receive unwanted banana phone calls from bananamarketers, or people who try to sell them products over a banana phone. Installing anti-spam software on your banana can stop Bananamarketers. Despite lies that he is a pirate, Maddox is actually a bananamarketer. Unsure of where to purchase your Banana Phone? Hutchison Telecoms in conjunction with their Yellow networks, opened small kiosks in shopping malls. Under the trading name of Bananarama these kiosks are usually fairly easily spotted by the distinctive striped uniforms of their service staff. So well known are the Bananas In Pyjamas that they even released a series of children's books and videos extolling the virtues of good communication. Bananarama stores were officially opened with much fanfare and even commissioned Coldplay to write the song Yellow for the official launch. This is the pizza restaurant. By popular request, an operator will make efforts to add Beijing-jing-jing-jing to this list. The smaller, portable version of the famous communication device known as Bananular Phone™ was invented by renowned scientist Shaquille O'Neal in 1986. Although used by many, no one really knows how the Bananular Phones really work. Bananular Phones are normally offered with a number of different skins in a wide variety of vivid colors, from toosoon green through mellow yellow to mushy brown and putrefied black. This man has a willyphone. A much less popular communication device is the cell prawn. Unlike a bananaphone, over time a cell prawn becomes unpleasant to have around. A 6-day-old cell prawn cannot be used without a gas mask. Furthermore, a cell prawn can only be used on Global Crossing's proprietary Shrimp Net. A lot of extremely misleading information about the Bananaphone has been published by the liberal media conspiracy. This should clear things up some. This a common error message on computers, and it is completely harmless. In fact, Microsoft hasn't listened to a single complaint. This page was last edited on 12 June 2014, at 13:15.